Tulips and daffodils are taking over D.C. just in time for the annual Flower Mart at the National Cathedral. Don't let your allergies scare you -- this festival also includes sightseeing, food, music, a massive book sale and activities for kids. You'll find the Flower Mart on the grounds of the cathedral Friday, May 1 from 10 a.m. to 6 p.m. and Saturday, May 2 from 10 a.m. to 5 p.m. 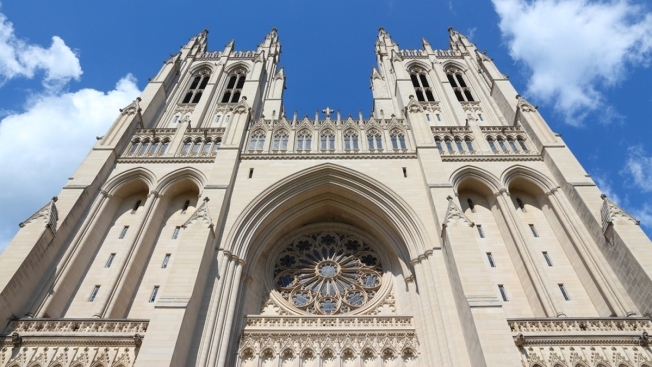 Parking will be available in the cathedral garage, and shuttle buses will run from Tenleytown Metro station. In addition, some 30-series Metrobuses and the Old Town Trolley also stop in front of the cathedral. This year's Flower Mart spotlights Asian flowers and culture. More than 23 Asian countries, as well as Taipei Economic and Cultural Representative Office and Hong Kong SAR, will participate with indigenous flower displays, ethnic foods, and traditional music and dance performances. This is a new feature for 2015. Along the outdoor gutter walkway between the two west towers, visitors can get a close-up look at the cathedral's whimsical and creative grotesques and gargoyles (including a Darth Vader grotesque for those anxiously awaiting "The Force Awakens"). This is $5 per ticket on Friday and Saturday from 10:30 a.m. to 3:30 p.m. Prepare accordingly: This climb is 333 steps up to the bell-ringing chamber, 300 feet above ground. Bring your sneakers on Friday from 12:30 p.m. to 4:30 p.m. for $7.50 and Saturday from 10 a.m. to 3:30 p.m. (except noon) for $10. Over 25 countries will exhibit indigenous flower arrangements created by foreign embassies to showcase their countries' flowers, histories and cultures. 2015 is expected to break the record for the most floral creations displayed in the nave of the Cathedral. Still need a gift for Mom? Flower Mart falls one week before Mother's Day, and will include more than 80 unique boutiques offering artisan-crafted jewelry, clothing, art and plants. Brose more than 10,000 books beneath a huge tent on the cathedral grounds. You'll find multiple genres of both fiction and nonfiction -- and at a bargain. Most books are priced between 50 cents and $4. New this year is a competition to see who has the greenest thumb, as four local florists compete. The Iron Florist Competition is Saturday from 11 to 11:45 a.m.
Kid-friendly activities include an antique carousel, dance and music performances, a puppet show, face-painting, and a climbing wall -- to name a few. Booths will line the grounds, offering something for any palate. You'll find funnel cakes and ice cream, hot dogs and burgers, as well as D.C. favorites like Ben's Chili Bowl. Continuing with the ode to Asia, Thai, Japanese and Chinese cuisine will also be featured.